I routinely carry two smartphones, partly because I'm a geek,and partly because I have a work and a personal SIM. These are usually in devices on two different smartphone OS: Windows 10 Mobile and Android, though the actual devices vary from week to week. 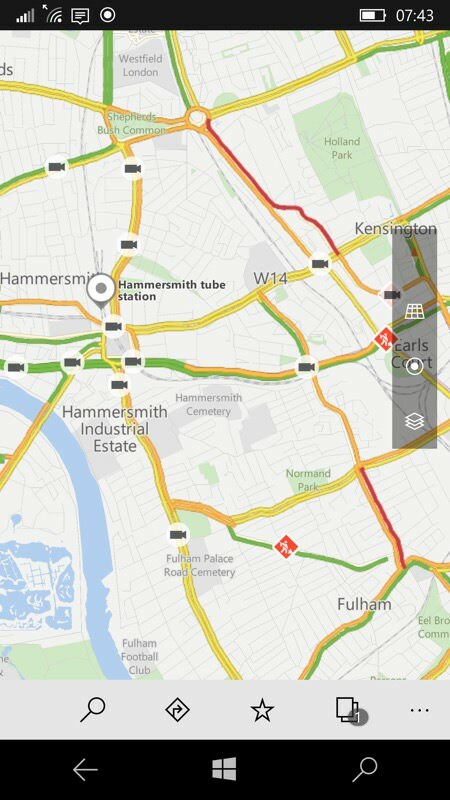 And, when driving, I've found that real time traffic in the appropriate Maps applications is a real differentiator. For Android... Ahem. Definitely more work to do for Microsoft's programmers. Now, you'll say at this point that the old HERE Drive+ application on Windows Phone 8.1 was traffic aware, but it only took traffic into account at the time of the initial route calculation. Which indeed seems to be what happens with Windows 10 Maps. Perhaps unsurprisingly, given that much of the latter's code was based on the former, though Windows 10 Maps does at least break out the 'live' traffic conditions graphically, i.e. you can browse around the country and spot slow and stationary traffic, at least on major roads (e.g. motorways and A roads in the UK). traffic information in Windows 10 Maps is very coarse, almost never extending to 'B' roads (in the UK) and often not covering many 'A' roads. 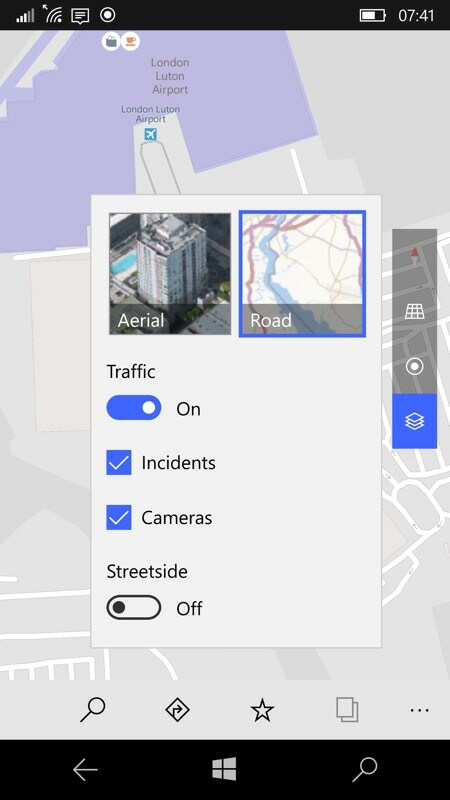 It seems as if Microsoft is sourcing its traffic data from recognised highway monitors (so we're talking automated roadside tranceivers and cameras) - which makes sense. It's just that you can't expect traffic information when away from the major roads. traffic information isn't updated in real time - or, if it is, then this data isn't fed back to the routing functions in Windows 10 Maps, in order to pop up something like "traffic incident detected ahead, re-routing you..." - which is what you'd want in an ideal world. 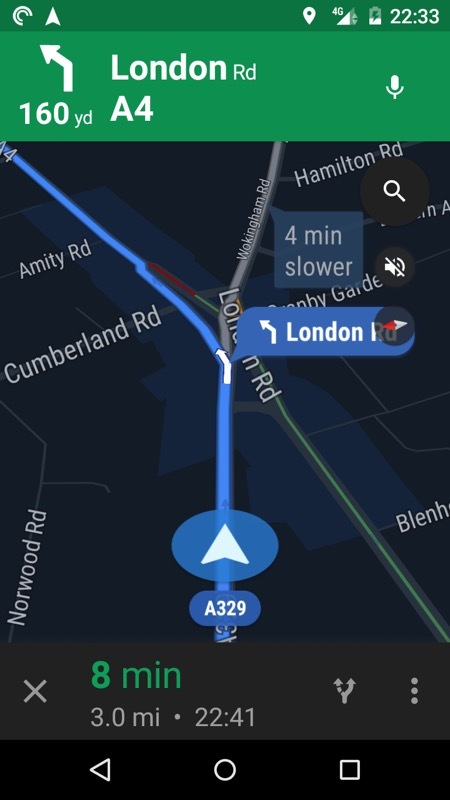 For major roads (here in Greater London) it all works pretty well, at least for initial routing calculations... And the cameras are a lovely touch. Amazing detail, really. Collated largely from real time monitoring, and pretty accurate. Another example from my own travels. Here I'm sitting in near stationary traffic (2mph shown here) and facing about a 5 minute wait to the roundabout. Yet there's zero awareness of all this in Windows 10 Maps. More data, more intelligence, both needed, if it's to compete. traffic information goes almost down to sub-village level. If there's a hold up on a country lane and cars are queuing then there's an excellent chance that you'll see this represented (e.g. in red) on Google Maps. Google can do this thanks to the data it's collecting (mainly anonymously) from all the other people driving along with the application open, i.e. there's an element of crowd-sourcing going on. This is factored in with explicit warnings and data points provided by Waze users (Google bought this three years ago), along with data from the same highways agencies mentioned above. 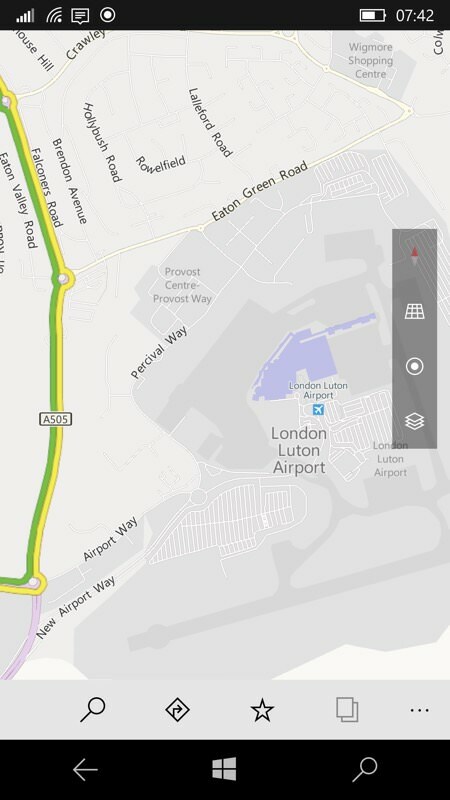 Add it all together and Google Maps can be frightneningly accurate. Certainly above 90% confidence in my tests. all the while you're driving, Google Maps is updating its model of where the traffic is feeding this back to the routing system. Thus, as you approach each roundabout you'll be told (graphically) how many more minutes each other exit will involve should you head down it. And the recommended route often changes, perhaps not down to the seconds level, but certainly if there's a multi-minute hold-up then you'll be told about it and hopefully routed around it. Is this just me griping about Google Maps being better than Windows 10 Maps for this one use case? Well yes, but I don't think it's unreasonable for Microsoft's programmers to improve Maps with regard to updating the traffic model and dynamically changing routes if need be. 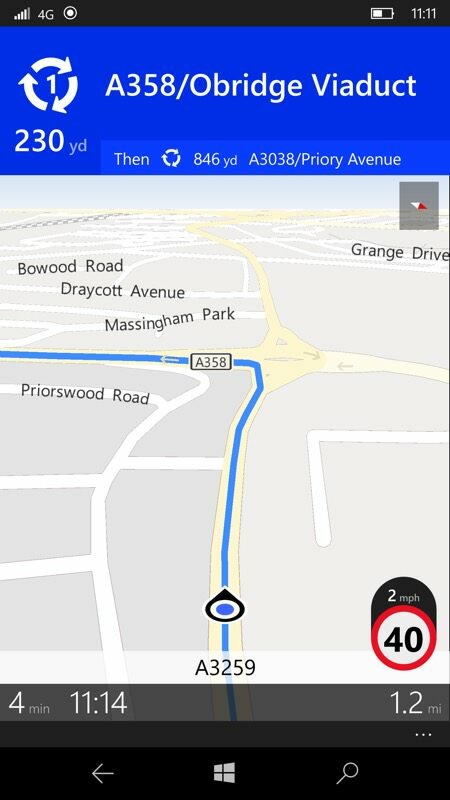 I recognise that there's unlikely to be enough cars on the road in any country to produce real time crowd-sourced data, and there's no Waze integration, but at the very least Maps should use the traffic data it does know about more intelligently. Microsoft, this would seem an involved but eminently do-able bit of coding. Pretty please? 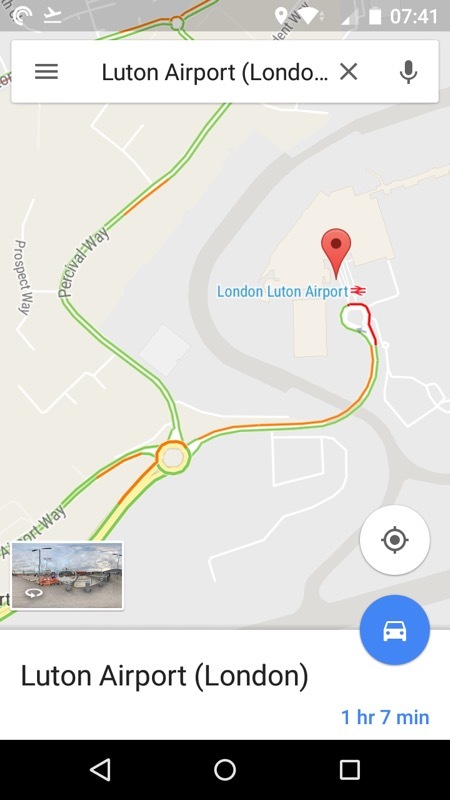 And while you're at it, have a chat with your pals in local highways agencies - it can't just be Google that has the really detailed traffic, surely?